Okay a little bit more. Thursday I continued the printer/scanner break down that Jen started, removing the metal assembly from it’s plastic case. One of the printer’s circuit boards yielded up more parts at heat gun point, primary target the connectors for the motors. I set up a “nail board” of sorts by shoving screws through cardboard and attaching alligator clips on the back that were connected to the various motor leads. 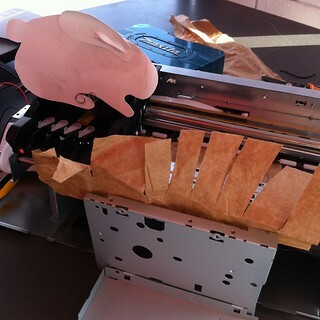 Once I had control over the motors I turned the printer into a little puppet show. This project finally begins to show what kind of embellishments I want to make to all of the motor projects. I’m afraid I don’t have much time to break down all the steps I took today to make the bunny hop. Below are images from the Flickr set which has more information in it, including pictures of the quickey nail board. I traveled light today and didn’t have any extra perf board on me to make more stable connections. Nor transistors. That meant creating the improvised set up, which is better for prototyping anyway. Intel Pop Up Experience w/ Maker Ed – Day 9, a set on Flickr. Pingback: carlynorama | Intel Experience Store – Day 17 Recap: Some days are tidying days.